The origin is very recent and started when volcanic eruptions occurred (between 14,000 and 27,000 years ago), during which issued a series of pyroclastic flows estimated in the order of 20 km3 which covered an area of approximately 700 km2 and, volcanic activity ended after forming the Cerro El Colli 27,000 years ago, which is the most recent dome. The forest La Primavera with 140,000 years of existence, is the largest ecological reserve that is near Guadalajara Metropolitan Area; has survived thousands of years to multiple adverse circumstances, however, has been diminished by the action of human, you should want to learn the lesson of which is of great importance, and care for it and preserve it. 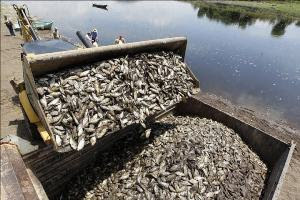 MEXICO CITY – Authorities are investigating the deaths of thousands of fish due to a molasses spill in the western state of Jalisco, a spokesman for Mexico’s Profepa environmental protection agency told Efe. An investigation was opened on Monday after officials received complaints from the Los Pinos fishing cooperative in the city of Acatlan de Juarez, where the Hurtado dam is located, and the government of the city of Tlajomulco. The fish kill was apparently caused by an “environmental accident,” the Profepa spokesman said. Molasses “is not a toxic substance,” but it produced a chemical reaction that eliminated the oxygen from the water and killed the fish, the Profepa spokesman said. A local business dumped the molasses in a ravine and it was washed into the sea by the rain.